The White Widow Automatic is a new cross of a classic Dutch strain, White Widow, recognised by most smokers and growers as an absolute classic strain. We got our hands on a great clone of the original White Widow variety and crossed it with our finest autoflowering strains. Like the non-autoflowering original White Widow, this strain has wide, dark green leaves and is dusted with a heavy coating of resin. The White Widow Automatic replicates the original White Widow very closely but only takes around 75 days to grow from seed to bud. The only real difference is the autoflowering growth, smaller size and slightly more physical stoned effect. The buds, despite their hybrid genetics, have a mainly Indica appearance and effect. The White Widow Automatic has a sweet and sour, citrus-like aroma and taste, similar to but not as strong as White Widow. This strain was bred for a few years to ensure stability in the genetics. Indoors it will grow to an average height of around 50 cm, with some larger plants reaching 100 cm. 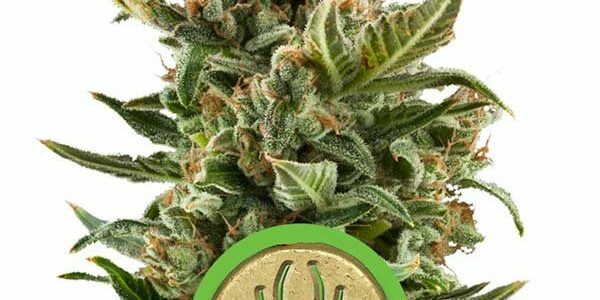 Its yield is quite good for an autoflowering strain and it will produce around 190 to 240 grams per plant depending on conditions. White Widow Automatic Review from Royal Queen Seeds on Vimeo.